They come in black and black only. They cost $188 a pair. These pants are made for men, no women’s models available, and they are sewn one by one in a facility in Oregon. Thunderbolt Sportswear’s namesake and debut product, the Thunderbolt Softshell Jeans, look like a normal pair of black denim pants. In reality, they are likely not similar to any pants you have ever put on before. To the point, the jeans’ fabric fibers are coated with millions of nano-size particles that are made to mimic the surface of a plant leaf. The goal is to make the pants “self-cleaning,” as mud, dirt and gunk has a hard time sticking to the fabric face. That’s right, some serious tech has gone into the making of this fabric, which comes from Schoeller Textiles AG, a Swiss company most often associated with stretchy, breathable jackets and stylish alpine outerwear. The Thunderbolt pants are in fact made with the same material found on high-end jackets that might grace the back of a mountaineer. It is stretchy, comfortable, durable and highly resistant to wind and rain. A macro trend in the outdoors industry is to make technical clothing disguised in “street wear” designs. These jeans are a great case study of that theme. Last month, I put a pair of Thunderbolts to the test on a long trip through South America. In three weeks away, I wore the jeans for at least seven or eight of the days total. The funky fabric, which is comfortable and resistant to wrinkling, is perfect for travel. A week into my no-washes wear test the jeans still looked like new. Cloaked under the jeans’ nice design, the Thunderbolts have the performance attributes to stand in for hiking, climbing, or even light runs. I wouldn’t intentionally climb or cross-country ski in these pants. But with their stretchy character and weather-enduring fabric the jeans acquiesce easily with activity in the outdoors. I like the clean look of these jeans. They are comfortable. Nice touches include a brass waist button and a hidden zipper pocket on back. For $188, the jeans require a serious chunk of change. For frequent travelers who want to minimize clothing on the road, they might be a reasonable choice. Outdoors types will gain serious style points if wearing the Thunderbolts on a hike or a climb. 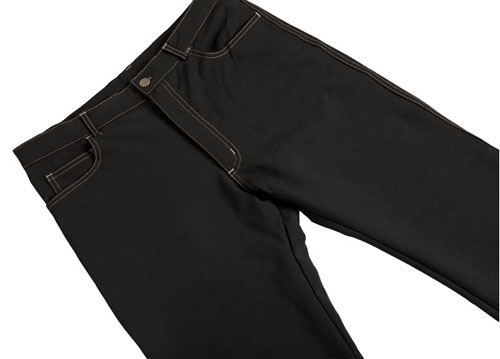 In these jeans, rocking the nano-particles and the stretchy fit, you could quickly become the talk of the trail.